Thanks to an awesome group of volunteers who came to visit us at the Natural History Museum London today (Visiteers), the second batch of Chalcid slides in the Magnified section have now been completely classified! Hurray! Visiteering is one of the ways in which we invite the public to take part in our science at the museum, and today’s stellar group has set an all-time record for number of classifications in one day. Absolutely Awesome. We’ll try to get the third and final batch of Chalcid slides launched in a new Expedition soon – but in the meantime, a VERY big thank-you to the Notes from Nature community and our Visiteers in the museum for all of your help in setting this data free. 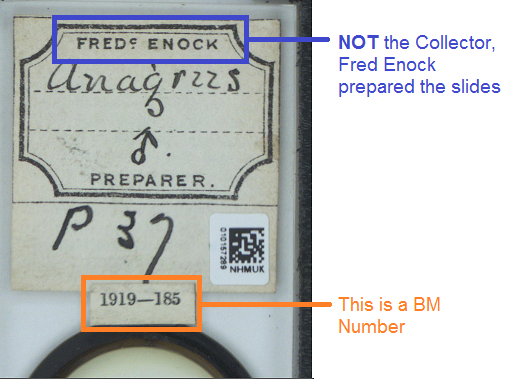 For those of you who have been helping us to transcribe the Chalcid specimen labels in Miniature Lives Magnified, you’ll have been coming across one particular style of slide label that always get us flipping our heads from side to side to read. 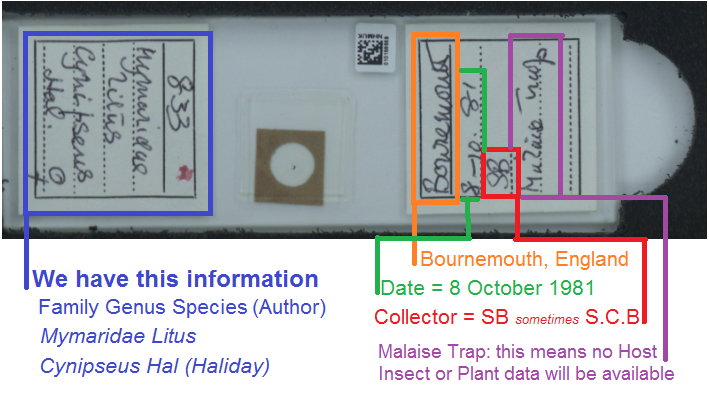 And almost all of those specimens seem to have been collected in Bournemouth, and the surrounding area. Once you start seeing a few of these, you’ll start to notice that they are all marked ‘S.B.’ – who is in fact the Collector of these specimens. I started to become curious about the mysterious S. B., and the hyper-local nature of his or her collecting, so I decided to do a bit of sleuthing with the help of our Curator Natalie. So here’s what I’ve found out. S.B. is Sidney Charles Scarsdale Brown – born in London in 1903, and passed away in Bournemouth, Dorset in 2003. “At the present time, the Society is very fortunate to have as a member Mr S.C. Scarsdale Brown. He joined the Society in 1937, was Chairman of Entomology 1939- 48. After a few years away from the Society, he rejoined in 1967 and was – 44 – President 1975-76, the subject of his Presidential Address being “The Natural History of Bournemouth 1800-1900”. He edited the Proceedings from 1978-82 and is now an Honorary Member. He has lived all his life in the Bournemouth area, working as a Dental Practitioner. As a young man his interests centred on the Macrolepidoptera. He met W. Parkinson Curtis, who became a life-long friend, and joined the Society for British Entomology. There he met eminent entomologists such as Lt. Cdr. Fraser and William Fassnidge. The latter introduced him to the world of Microlepidoptera, at which he quickly became an expert, especially on the group of tiny moths known as Nepticulidae. Mr Brown was one of the contributors to the Illustrated Papers on British Microlepidoptera published in 1978 by the British Entomological and Natural History Society, his paper being illustrated with the superb paintings of Lt. Col. Fraser. A meeting with Philip Harwood – one of the finest field entomologists – further added to his interests. Harwood concentrated on what are known to Lepidopterists as “Other Orders”, i.e. groups such as Coleoptera (beetles), Hemiptera (bugs) and Hymenoptera (bees and wasps). Scarsdale Brown has studied all these groups, but has become one of the country’s leading specialists in Aculeate and Parasitic Hymenoptera. His meticulous and painstaking fieldwork is illustrated by his work on the group of Parasitic Hymenoptera known as Fairy Flies (family Mymaridae). This contains what must be some of the world’s smallest insects – one of the largest of the fairy flies has a wingspan of only 3mm; they pass their larval stages inside the eggs of other insects such as dragonflies. During the course of his study, he has recorded 7 species of Mymaridae new to Britain. His collection of specimens is a joy to behold – each fairy fly mounted in a microscope slide, and the tiny Nepticulid moths perfectly set. Mr Brown is an excellent artist in watercolour, and has contributed many notes to entomological magazines. Over the years the members of the Society have heard some fascinating lectures from him on Hymenoptera and other groups. In 1988 he received an award in the Manse 1-P leydel 1 Prize Essay Competition. We’re pleased to launch our second batch of microscope slides featuring the parasitoid wasps called Chalcids (pronounced ‘kal-sids’), which lay their eggs inside other insects. The eagle-eyed amongst you will have noticed that we have updated the Expedition title from ‘Killer Wasps’ to “Miniature Lives Magnified” and have made some small tweaks to the structure of the Workflow, and have also attempted to make our instructions and ‘Need more Help?’ text and examples more clear. Do drop us a note in the Talk forum if we can continue to make further improvements. 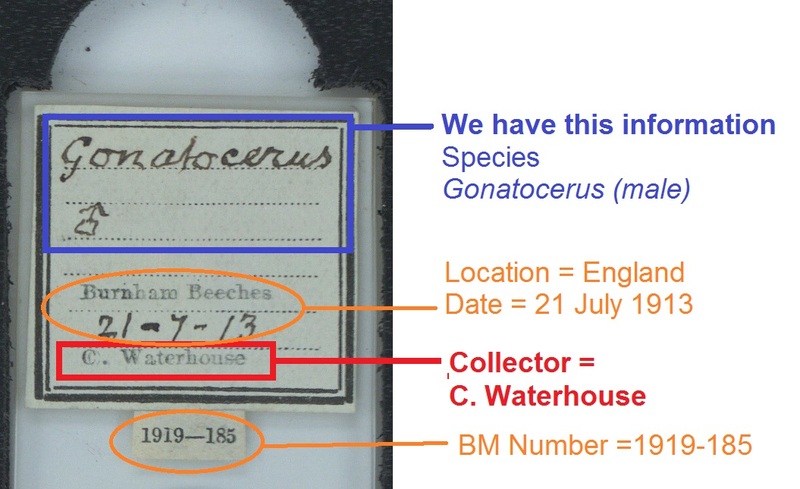 As part of our effort to digitise the collections of the Natural History Museum London, we have been collaborating with the Notes from Nature team to explore the potential of crowdsourcing the transcription of our specimen labels. Our first pilot project was called The killer within: Wasps but not as you know them, and was launched in the newly-created ‘Magnified’ section on Notes from Nature on August 16th, 2016. The purpose of this initial Expedition was to test the functionality of the platform, and the difficulty of the task for the community of volunteers. Your response was stellar – over 600 people got involved in completing the first batch of 2,000+ slides – a particular thank-you goes out to our 9 super-transcribers @maggiej , @reinheitscat , @dfreezor , @Sagaman , @HDumas , @RedBee , @stevenhm , @rgerman , and @Mikusan. The data-set that you have created for us is looking good. We are therefore launching our second batch of slides with confidence! These microscope slides feature parasitoid wasps called Chalcids (pronounced ‘kal-sids’), which lay their eggs inside other insects. These tiny wasps are parasitoids, meaning they lay their eggs inside other insects. When chalcid eggs hatch the emerging larvae eat the inside of their host. They then grow and pupate until mature enough to burst out as adults, finally killing the host. 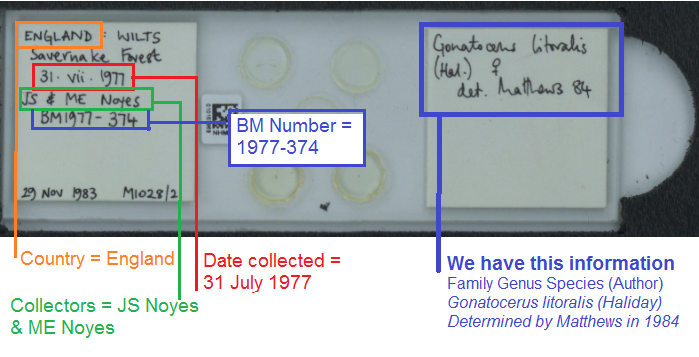 We have 6286 microscope slides in the collection and are asking the crowdsourcing community to collect data about when and where the specimen was collected, who by, and what host species it was collected from, as well as some museum collection data. These microscope slides contain the smallest members of the Chalcidoidea Superfamily, which are unfortunately impossible to see in the images on Notes from Nature – we encourage you to take a peak at those that are large enough to pin – their variety and beauty is amazing!